It’s been almost 30 years since Mike Tyson’s first world title fight. Cus didn’t live long enough to witness his protégé become champion. ”Iron” Mike may have exhibited menace and maturity inside the ring, but outside of it, he was a vulnerable young man, who still needed the guidance and stability his father figure provided. Equipped with such shrewd, compassionate tuition, Tyson would almost certainly have coped far better with the pressures and temptations that are inevitable when catapulted into international superstardom – his fighting prime would very likely have been extended. As was the case in early life – when growing up in crime-ridden Brownsville, in eastern Brooklyn, New York City – Mike was again, forced to learn the hard way. Nevertheless, commencing with a TKO of WBC titlist, Trevor Berbick, in November 1986, the deceptively skilful knockout artist needed merely a further 17 months to vanquish the remaining champions: WBA holder – James “Bonecrusher” Smith, IBF titlist – Tony Tucker, and Ring champion – Michael Spinks. During this time span he also KO’d three former champions. A modern equivalent would be if current heavyweight talents, Anthony Joshua or Joseph Parker, were to defeat all of the following men by the end of 2017: Deontay Wilder, Charles Martin, Tyson Fury, David Haye, Wladimir Klitschko, Alexander Povetkin and Ruslan Chagaev. That’s one almighty gauntlet. Three decades on from Mike Tyson’s trail of destruction, here is a countdown of his best 5 victories. Thomas, the former WBC champion, had lost just once in his career – on points to Trevor Berbick. After weathering an early onslaught Pinklon seemed to have settled into the bout…but in the 6th round, Tyson unleashed a truly sensational, two handed salvo of vicious, full blooded shots, putting an end to the fight. Larry may not have fought for almost 2 years, but he’d only ever lost twice – both close decisions to Michael Spinks. “Iron” Mike’s thunderous right hand in the 4th round cracked the former champion on the chin, sending him crashing to the canvas. Larry somehow continued the fight, but Tyson pounced, producing a frighteningly brutal finish, the final swinging right hook of which, left Homes motionless, flat on his back. What was Holmes’ assessment of his conqueror? This was the only time “The Easton Assassin” was knocked out in 75 fights. No robe, no socks – a throwback to his idol, Jack Dempsey – Tyson was a 5 foot 10 inch, 221 pound, intimidating block of muscle. Black shoes, black shorts, and a stare which seemed to convey a simple message: “I want to beat you senseless.” Tyson was not simply a heavy handed slugger though. D’Amato had helped craft a highly skilled prize-fighter, one whose evasive lateral movement made him difficult to hit cleanly, but whose speed of foot meant he was usually in a position to land painful counter punches. Mike’s calculated aggression, and quick, accurate punches, hammered Berbick, leaving him with his mind scrambled, sprawling on the floor. At 20 years, 4 months of age – with this 2nd round TKO to capture the WBC belt – Mike Tyson had become the youngest ever heavyweight to hold a world title. There are some that say Tyson was no more than a heavy handed bully, who lost to the first big, technically sound heavyweight that he fought. As soon as he met an adversary that could take his punch and fire back, he lost. Tony Tucker stood 6 foot 5 inches, was an athletic 221 pounds, and had an impressive 82 inch reach. He could take a shot, and blatantly, was unafraid of “Iron” Mike. Tucker, 34-0 (29 KOs) – having stopped “Buster” Douglas in the 10th round for the IBF title in his previous fight – proved he could rattle Tyson by landing a short left hook in the 1st round. Mike shrugged it off, and dominated the majority of the fight, becoming the first man to unify the WBA, WBC, and IBF titles. Boxing history is littered with cases of undersized fighters troubling full blown heavyweights. In 1941 Billy Conn came within a whisker of dethroning Joe Louis. In 1992 a 205 pound Evander Holyfield had a fantastic battle with Riddick Bowe, and more recently, Chris Byrd – who began his professional career, weighing 169 pounds – was able to frustrate and dodge the power of the 6 foot 7 inch Vitali Klitschko. Michael Spinks – widely regarded as one of the five greatest light heavyweights of all-time – was big enough, and more importantly, good enough, to twice beat Larry Holmes, and then stop the 6 foot 5 inch, 238 pound, Gerry Cooney. A 21 year old Mike Tyson was a different proposition altogether though. 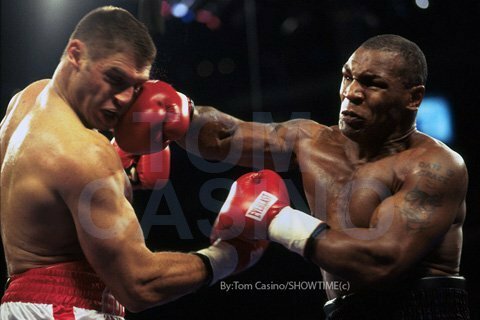 In many ways it is a shame that the Tyson/Spinks fight did not last longer, as “Iron” Mike was at the peak of his powers that night in Atlantic City, and it was the perfect stage to showcase his artistry. Still, in the 91 seconds that the “fight” lasted, he looked truly unstoppable: this version of him would surely have been a serious threat to any heavyweight that has ever lived.